This City of Collinsville property (shown above ... east of the tracks, west of 5th Street and south of 156th St. North) is being considered as the future location of Bisco Manufacturing. The land has been used for special City events and by the model airplane club. The Collinsville City Commission / Municipal Authority met Tuesday, Sept. 2, 2003 (instead of their normal Monday session due to Labor Day). Commissioner Gail Rogers and City Clerk Dana Conners were unable to attend due to class conflicts. Ron Scott was nominated and approved as the new Ward IV member of the Collinsville Board of Adjustment. Approval was given to close Main Street for the Homecoming Parade on Friday, September 19th. 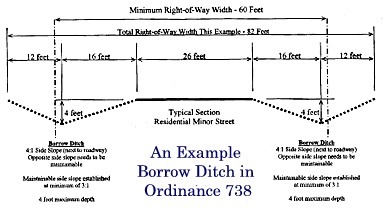 The City also modified it's 2001 ordinance which had restricted the use of "borrow ditches" within the city limits. The change will allow "borrow ditches" on lots with at least 150 foot frontage (and/or 24,000 square feet of lot size) if they meet a specified design including headwalls on culverts under driveways. The Municipal Authority voted to have the city property north of town appraised in response to an offer by Bisco Manufacturing to buy or lease the land for a proposed door manufacturing complex. City Manager Mike Tinker met recently with three local residents involved with planning the venture. The Municipal Authority also established a committee to negotiate the property offer. The initial discussions with Bisco emphasized a positive combination of jobs and sales tax income for the City. Mike Tinker indicated that the sales tax benefit to Collinsville might be reduced by a recent law change (effective in November) that would move the sales tax to the point of delivery instead of the point of sale for certain material supply.